Road trips. Could there be anything better? Right now we’ve launched into Spring and life on the road becomes an extremely enticing proposition when there’s an opportunity to jump in a campervan and explore. It’s music to our ears, in fact! As Walt Whitman once said: “I take the open road, healthy, free, the world before me.” In the spirit of Walt’s celebration of life on the road, here are 7 great reasons why the humble road trip ticks all the boxes for a memorable holiday. While you can park your wheels in some amazing caravanning and camping parks throughout Australia, you can also camp for free in many designated places, but with a few conditions, of course. The beauty of a campervan is it’s self-contained, so you don’t leave anything behind or have a negative impact on the environment. Then there’s plenty of public land that permits free camping and some land owners don’t mind you pulling into their property for a night for those bold enough to ask the question. Your home on wheels allows you the luxury of parking at popular (or remote) beach spots and there is no better way to enjoy life on the road than catching a sunrise over brekky or dinner with a nice local wine watch the sun set on the horizon while surfers catch a few last minute waves. My tribe recently pulled in at Alexandra Headlands at the This is an area that’s definitely off the beaten path. The most fascinating aspect of this town is the fact that most of its inhabitants have lived underground for hundreds of years to escape the scorching heat. Guadix actually has the highest concentration of cave dwellings in Spain. You can drive through the area or explore by foot. You can even spend a night in one of these caves, and check out ones that have been modernised to include marble floors, luxury furniture and even internet connection. 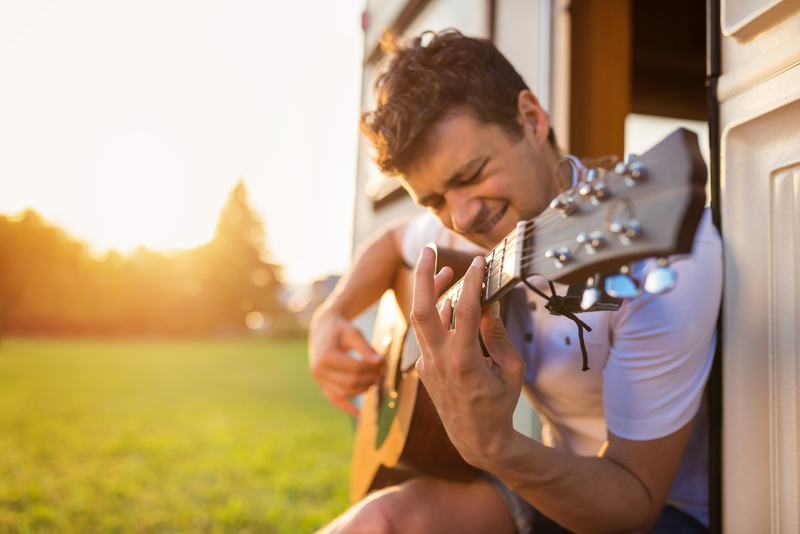 There is no question every campervan road trip requires a trusty acoustic guitar packed away somewhere. If not, then a portable speaker and a connection to Spotify is a last resort! Best to go old school, however, and pull out the six string especially when there’s a campfire in the mix. Isn’t funny how you’ll always find someone who can strum a tune when there’s a campfire gathering? The golden hues of the fire, the crackles of the wood popping, the smorgasbord of stars shining in a clear black sky at night, and the relaxed warmth of people gathered around … who doesn’t love campfires? We at DriveNow don’t think anyone should fork out a fortune to live their campervan holiday dream lifestyle and the good news you don’t have to. Renting is a damn good option if you’re talking about one, two or three campervan trips a year. So how do you unlock the best deals? You start by heading to the DriveNow campervan rental portal where you have a choice of four excellent countries to explore, let alone only Down Under – Australia, Canada, New Zealand and USA. The range of brands (Maui, Apollo, Britz and company) are priced once you pop in your details and the best price gaurantees are presented. But here’s a big tip – consider the relocation deals. It’s here where the companies are keen to reposition their rentals to cities of greatest demand, and the price can be ridiculously good! At the time of writing, there were 45 deals on offer in Australia and 42 in New Zealand. An example? Melbourne to Adelaide in a Britz Venturer for $5 a day! Now I don’t know about you, but I reckon a couple of days cruising around the Barossa Valley, stopping off at a nice holiday park and pulling out the guitar over a red or two sounds just about right. There are some great park chains around the world and if you plan on campervanning your way around more than a few times in the coming years it’s a no brainer to join one of the membership rewards programs. In Australia and New Zealand, think Family Parks or Big4. Fork out the $40 for two years with Family Parks, for example, and you can save up to 10% of site rentals (third night free) at Family Parks throughout Australia and New Zealand. There’s your money back and more already. Righto, so you’re planning to rock out at a music festival or you’re planning a New Year’s Eve spectacular in Sydney, but let’s face it – hotel accommodation can get pricey especially when there’s demand. Not on a campervan, however. BUT, you must plan early and make sure you’ve booked well in advance.